You have probably heard the terms service dog and assistance dog before, but do you know what these terms truly mean? Generally speaking, a service dog or assistance dog is a working dog specially trained to help a person or group of people with a disability or specific needs. However, there is a bit more to the definition of a service dog, especially in the eyes of the law. A service dog is a type of working dog but is very different from other working dogs like police dogs and search-and-rescue dogs. According to the Americans with Disabilities Act, "service animals are defined as dogs that are individually trained to do work or perform tasks for people with disabilities." The dog must not be a pet, but be specially trained to assist the handler with something directly related to his or her disability. Emotional support dogs are not considered service animals. In addition, therapy dogs are not considered service dogs in the eyes of the law. The ADA also notes that their definition of a service dog "does not affect or limit the broader definition of 'assistance animal' under the Fair Housing Act or the broader definition of 'service animal' under the Air Carrier Access Act." Under the ADA, service dogs cannot be denied entrance to businesses (even food service establishments), state and local government facilities or nonprofit organizations that serve the public. However, service dogs must be under control at all times. This generally means they should be leashed or harnessed (unless these get in the way of the dog's duties, in which case the dog must still be under the handler's control). Is the dog indeed a service animal and required to assist with a disability? What specific task(s) has the dog been trained to do (in service to the handler)? Handlers of service dogs cannot be charged more money because of their dogs, nor can they be denied the rights and access granted to those without service animals. Disabled persons with service dogs can only be asked to leave the premises if the dog is out of control and it cannot be corrected by the handler, or if the dog is not house trained. 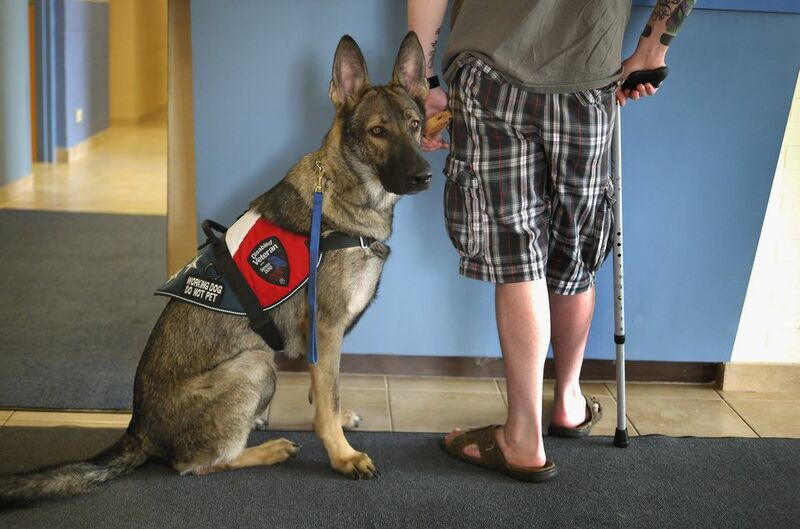 Most of the time, service dogs can be easily identified. Many wear special vests and/or harnesses and pay close attention to their handlers. However, special identification is not actually required. Never assume that a dog is or is not a service animal. Always be sure to ask before petting a dog (even if the dog is a pet, this is essential to prevent bites). Service dogs should not be petted, fed or otherwise given attention while at work. Please be respectful and allow these dogs to do their jobs. They make a major difference in the lives of disabled persons. There are no specific rules about what a service dog should or should not wear. They do not need to be identified with special harnesses or vests. Could Your Dog Be a Service Dog? Have you ever seen a service dog with its handler and wished you could take your dog everywhere with you too? You're not alone. However, wanting this and needing this are two different things. Too many people are trying to pass their dogs off as service animals, and they are ruining it for the people who truly need service animals. People with service dogs rely upon their dogs to let them live their lives more as the average person can do without a dog. They get their service dogs from special training programs. In most cases, they do not transform their pet dogs into service animals. However, there are exceptions. Some people have been surprised to find that the loyal family dog has a natural talent, such as the ability to detect low blood sugar and wake up a sleeping diabetic and save a life. First, the dog should be trained to perform a specific action that clearly alerts the handler to low blood sugar. Next, train that dog to behave properly in public so the dog can go everywhere with the diabetic handler. Then, that pet can be called a legitimate service dog. Putting a vest on your pet dog does not make him a service animal. There are plenty of online service dog registries that will gladly take your money and issue a certificate. That does not make your dog a true service animal. If you do not have a disability but try to make your pet dog into a so-called service dog to get him on a plane with you, into a restaurant, or into some other public place, you will only add to the mistrust business owners sometimes have towards service animals. The ADA rules are intended to ensure that no disabled person is interrogated or made to feel inferior. This is an important rule. However, it also makes it easy for selfish people to take advantage of the law and try to pass off their pet dogs as real service animals. Most states have no laws against this, and even if they did, it would be difficult to prove you are not faking. However, the simple truth is this: it is unethical and immoral to pretend your dog is a true service dog. Unfortunately, many phony service dogs behave poorly in public, most likely because they have not gone through rigorous training programs. Fake service dogs may cause damage to property, harass other customers, or create general chaos. This unruly behavior could potentially harm the business, making proprietors suspicious of future service dogs. It also makes legitimate service dogs and their handlers look bad. Even if your dog is well-behaved, passing off your dog as a service animal is just plain wrong. Doing so is only going to make it more difficult for truly disabled persons to have the service dogs that they honestly need.